The question is no longer whether climate change is causing the oceans to swell, but by how much and how quickly. Pilkey and Young deftly guide readers through the science, explaining the facts and debunking the claims of industry-sponsored “skeptics.” They also explore the consequences for fish, wildlife—and people. While rising seas are now inevitable, we are far from helpless. By making hard choices—including uprooting citizens, changing where and how we build, and developing a coordinated national response—we can save property, and ultimately lives. With unassailable research and practical insights, The Rising Sea is a critical first step in understanding the threat and keeping our heads above water. "Sea level rise is a lurking dragon. Experts chart its pulse nervously, but speak quietly. Pilkey and Young pierce this reticence, telling a story that the public must understand—or the dragon may burst out of humanity's control." "A must read for all Americans. The authors are among our most eminent coastal scientists. They deliver, in clear and measured prose, an urgent message explaining how rising sea levels will affect New York, Miami, Houston, Los Angeles and every coastal community in our country." "An excellent, easy-to-read exploration of how oceans change and how the changes affect people—their property, their relationship to nature, and their perception of what is permanent. This is a fascinating book for all concerned about the state of the planet we are leaving to our descendants." "The Rising Sea is a must-read, not only for those of us living on the coast but for everyone concerned about meeting the challenges of the future." "The Rising Sea takes on a host of contentious issues, ranging from the science of climatology to the politics of coastal planning to the economics of engineering, all the while taking into account the perverse psychology of a populace loath to acknowledge the truth when doing so proves disruptive. Although insistent, Pilkey and Young are never unduly alarmist." "One of the things I like best about The Rising Sea is its inclusion of many examples of climate-change adaptation, which suggests an emerging emphasis on climate-change adaptation and linkages between the natural world and people." "Pilkey and Young's balanced, optimistic perspective on the tough decisions that lie ahead should garner interest from policy makers and real estate developers as well as environmentalists." 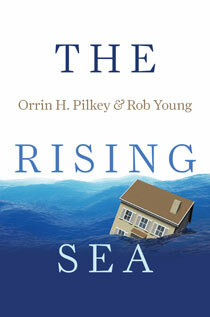 "The Rising Sea....is a book that is likely to inspire many. The authors knowledgably and effectively sound the retreat from the coast."